Permanent Green, (PG 36, PY 74) is the modern substitute for the original Cadmium Green Med that has been discontinued by so many manufacturers. Early on in my painting classes, I would hear how wonderful Cad Green Med was, but not knowing any difference and also liking what I could do with Cadmium Green Lt (WN) there was never a need to go investigate. Then last year, I began the Bountiful Observations series, and the need to know and understand more green mixtures became important. And now that we are entering spring, and life is beginning to peak out of the ground, and buds will be blossoming soon, I thought it would be a good thing to introduce my favorite hardworking green that mixes so well… these six mixtures are just the beginning. I love how this color mixes with black and oranges also. 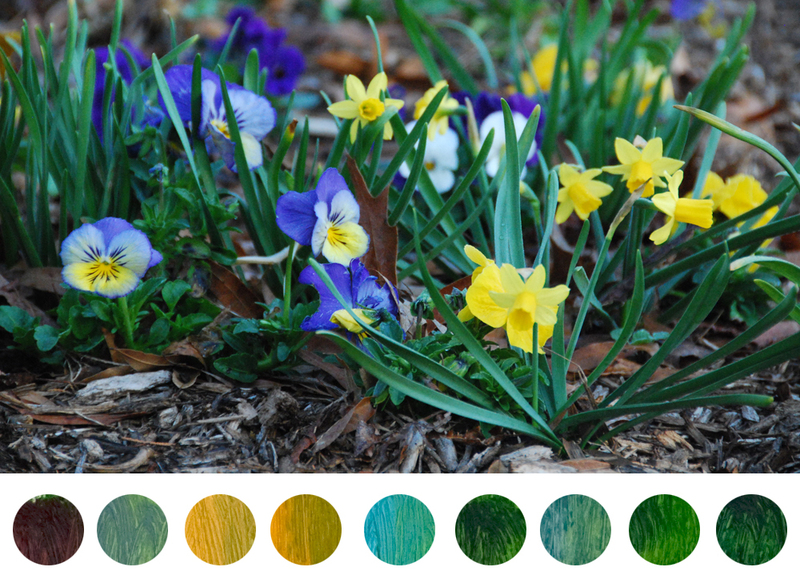 The thing that permanent green does best is support and emphasize the color it is mixing with, so when you mix it with blues, you are able to attain the soft blue-greens of the leaves and stems from flowering bulbs. And I think when mixed with other greens, like viridian, it just deepens the green without turning it too “electric” green. And being a semi-transparent pigment, I like to skim this green over a permanent rose or aliz. crimson underpainting, for the shadow areas. See how cool this green can go when mixed with the different blues, but how it warms up and glows yellow-green when mixed with the cadmium yellow. This color also mixes well with cad. lemon, and cad. yellow lt, and I particularly also like it mixed with indian yellow, because you get a very transparent and staining rich yellow-green. When working on a landscape, this green can be added to colors to bring it forward or push it backwards, hyping up its color saturation or neutralizing it depending on whether it is mixed with a analogous color or compliment. Permanent green falls into a warm temperature of the greens available because of its yellowish cast when strait out of the tube, but I find it adapts well, and even mixes well with a third color. I love Permanent Green because of its ability to adapt and mix with other pigments. Permanent Green is a semi-transparent bold middle value green. It shifts warm or cool depending on what you mix it with, and will mix with compliment reds to create a variety of deep and diverse darks, not quite mixing to a black, but rich neutralized purples. The Permanent Green I have been using most is made by Blue Ridge Oil Colors, I like how it stays open and the thick creamy consistency of the paint. Want to learn more about painting with oils? I have a teaching newsletter with actionable mini-lessons in each issue. Sign up here to receive more oil painting lessons.